Most cooks use a ton of garlic in their cooking; and if they don’t shame, shame shame! Garlic is good for the body and it makes so many foods taste better. A good cook always has fresh garlic on hand. Here is the easiest way I have found to peel it and always have a fresh amount of it in the fridge. My husband first told my about this method and have used it ever since. There is no muss, no fuss… and no smelly garlic hands afterward! Find two empty leftover jars. In the first put in a whole bulb of garlic. Secure the lid on the jar tight and shake, shake, shake. Seriously, pretend you are dancing to music and walk around shaking this jar as fast and as hard as you can. After a few minutes you will find that the bulb is now a mass of cloves and the paper has come off the cloves. One more step and you’re finished. Empty that jar onto a clean counter and separate the cloves from the paper. 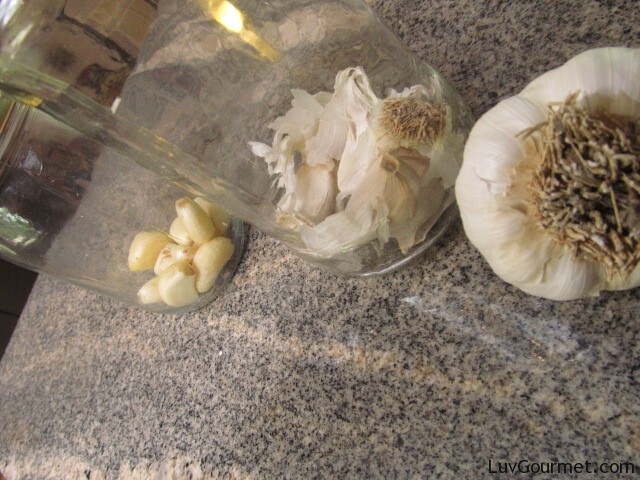 Transfer your peeled garlic to the second jar; secure the lid tightly and refrigerate. The end result is fresh garlic for a month. Now, how long did that take?